In Stellarnet Rebel, I refer to physicists inventing “particle engines” to “shift” space. I had to come up with some easy way for my heroine Genny O’Riordan to move from Earth to Asteria Colony — located on a planet orbiting one of the suns of the Alpha Centauri system. In a brief and (supposedly) painless blink, her colonization block crosses space, where it is met by tug ships that haul it to the planet’s surface and connect it to the settlement. 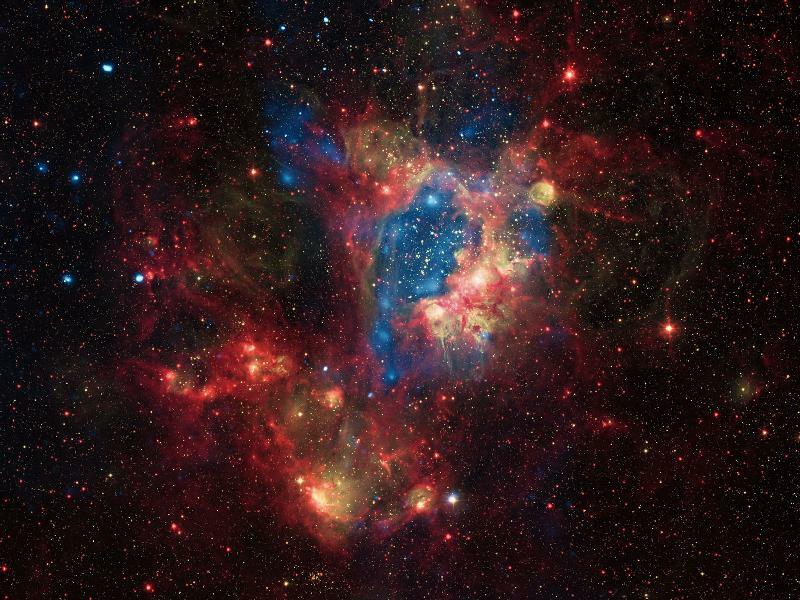 Large Magellanic Cloud (LMC), a small satellite galaxy of the Milky Way located about 160,000 light years from Earth. Image courtesy of NASA. Space travel was the one glaring bit of sci-fi “magic” I allowed myself in a book otherwise written with a lot of research and basis in fact. As I’ve blogged before, the technology in the Stellarnet Series is extrapolated from real trends and current devices. Everything from Google goggles to programmable clothing to interactive tabletops is already nearing the mainstream IRL. Even the alien characteristics are based on animals such as dolphins, electric eels and cockroaches. For the sake of the story, though, I had to wave the plot wand and say “science happens” so Genny could get across space without being 110 years old when she arrived suffering from radiation and rickets. I never thought that we might really be able to travel light-years in the blink of an eye. Certainly not within my lifetime. My readers will know that physicists are “a bunch of lying bastards,” and Genny suffers a kind of bizarre, temporary, all-over pain when shifting to Asteria. I wonder if that will come true, as well? What do you think? Even if it’s painful, would you take a chance to vacation on another world? Live there? Work there? What if you could “commute” home to Earth on weekends? Depends how much pain. Every time we drive up to the in-laws (5 hour trip in car with three kids) I long for someone to invent a teleporter. I loved reading about this! It’s exciting isn’t it? Then my husband tried to discuss how cool it was in specific tech detail and my brain started to hurt. I love science, but trying to understand this one might take me a while. I agree. This is mind-blowing. I know it won’t come to pass till long after we’re dead, and anti-matter is more than a little difficult to come by, but the fact that it’s POSSIBLE… I man Holy [insert Klingon expletive here]! Biggest news story of the year if you ask me. Now where’s Zephram Cochrane at? ← Coming Soon from Carina Press..